Possibly the biggest problem with cycling uptake among city dwellers is the prospect of spending a fortune on a bike, only to have it stolen while it&apos;s locked up outdoors. The Oregon Manifest Bike Design Project recently came up with two designs — Merge and Denny — that incorporated locks into the bikes themselves. But now the YERKA Project has designed a two-wheeler whose frame functions as a lock, requiring thieves to saw the frame — rendering the entire bike useless — if they want to steal it. 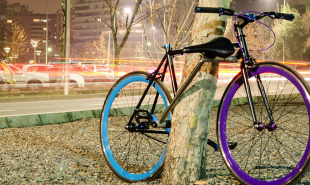 Developed by 3 engineering students at the Universidad Adolfo Ibañez in Chile, the bike doesn&apos;t require riders to carry around heavy duty locks. When it comes to locking up, the middle pipe of the frame can be split into two and rotated by 90°. The seat post can then be taken out of the back pipe and inserted between two holes in each section of the split middle pipe and locked into place. The result is robust security that protects both the bike and the seat, which is usually easy for thieves to release and steal. Because the lock is made out the bike frame itself, thieves would have to saw through the frame in order to take it. But doing this would render the bike useless and worth less in resale value, and it&apos;s likely that thieves would simply move on to find a more conventional bike. The Yerka bike currently only exists in the form of a single prototype, but the young team are working with Garage UAI, the university&apos;s platform for student entrepreneurship, to help raise money to make the bike a reality. Are there other ways to discourage bike thieves?